Then some of the scribes and Pharisees said to Him, “Teacher, we want to see a sign from You.” But He answered and said to them, “An evil and adulterous generation craves for a sign; and yet no sign will be given to it but the sign of Jonah the prophet; for just as Jonah was three days and three nights in the belly of the sea monster, so will the Son of Man be three days and three nights in the heart of the earth. The men of Nineveh will stand up with this generation at the judgment, and will condemn it because they repented at the preaching of Jonah; and behold, something greater than Jonah is here. The Queen of the South will rise up with this generation at the judgment and will condemn it, because she came from the ends of the earth to hear the wisdom of Solomon; and behold, something greater than Solomon is here." The driver has a knowledge of the rules of the road. Without that knowledge, a stop sign would either mean nothing, or cause the driver to immediately stop. With the proper background knowledge, the driver will know to continue driving until they get to the intersection, come to a complete stop, look around for hazards and then proceed through the intersection. Notice, the driver is not given these explicit instructions in the stop sign (it doesn't change to a GO sign!). The sign has an over-arching purpose. In the case of a stop sign, the purpose is to maintain order on the roadways. Theoretically, when drivers observe the road rules, accidents are kept to a minimum and traffic flows nicely. Hence, it is apparent that there are more factors behind a sign than meets the eye. This is not to say that signs are not organic; the knowledge, purpose and importance factors may process simultaneously upon first glance of the sign. However, it may be beneficial to deconstruct these unconscious processes and see what can be learned. After cross referencing Matthew 12 with the book of Jonah, I was able to isolate five (5) factors that play roles in the knowledge, purpose and importance of the Sign of Jonah as they relate to Christ's mission. These factors include 1) The Belly of the Whale, 2) The Persistence of Grace, 3) The Usefulness of Man, 4) The Global Love of God and 5) The Importance of Faith. These, of course, are in no particular order except for the first one. It always bothered me that Jesus would associate his ministry with that of Jonah. They seemed like polar opposites. As if Jonah was the foil to Jesus' mission. Perhaps that is precisely what Christ was saying. Perhaps Jonah, who had no power to control his destiny, was intended as a foil to Christ, who even claimed the power to lay down his life on his own accord. It is with this in mind that we explore the rest of the story of Jonah and how it serves as a contrast to Jesus' ministry. One of the major themes of the book of Jonah is the persistence of God's grace. Jonah even confesses that he knew God would forgive the people of Nineveh if they received the message. Jonah clearly does not want to share God's goodness with those people, which is why he refuses to obey in the first place. However, God's grace pursues him. God is intent on sharing the message of redemption to the Ninevites. He goes to great lengths in order to bring a prophet to their city limits. In that same way, God went to great lengths to send a savior in human flesh. Jesus sums up his ministry with the following phrase: To seek and save the lost. He was not concerned about reputation or appearances, he was concerned about relationships and reconciliation. His grace is persistent. He is willing that none should perish and does all he can to facilitate eternal life. This persistence of grace extends more to Jonah than to anyone in this story. Jonah deserved the fiery wrath of God for his disobedience and insolence. However, he receives nothing but grace. God does not dump his prophet in search of a man who is more worthy to bear his message. God seeks to redeem both the masses and the individual. A personal God is a valuable God. Jesus dealt with individuals, not only a faceless multitude. Consider the conversion of Saul to Paul. Jesus came to repair a relationship with God and make mankind useful to him again. We may not see the value in our own lives, but he certainly does. Even the final episode of the book of Jonah is meant to show the tenderness of God. He tries to help Jonah see things from his own perspective. Christ did not come to condemn, but to offer life; to offer a chance to see things from his perspective. That is what is meant by the phrase: to have fellowship with God again. He restores the natural order of things with man in proper relation with him. Useful. Nineveh (to the North), Solomon (the hometown hero) and Sheba (to the South) expands the concept of God's global love as illustrated in the book of Jonah. Jonah was uncomfortable sharing God's love to the Ninevites. He held on to it as a right of his people only. But that is not God's will. The sign of God's global love is expressed in Jesus. John 3:16 explicitly states that God's love is shared to all mankind, not just one nationality. Every person has a chance to respond to this love, and there is only one way to do it. The response to God's message of love is faith. The Ninevites responded in faith and repented when they heard God's word. They believed that if they repented, God's judgement would be withheld. The importance of this response is clear in Christ's description of the sign. Had the people of Nineveh not repented in faith, they would never have received the grace and love of God. Without repentance, they are only left with judgement. 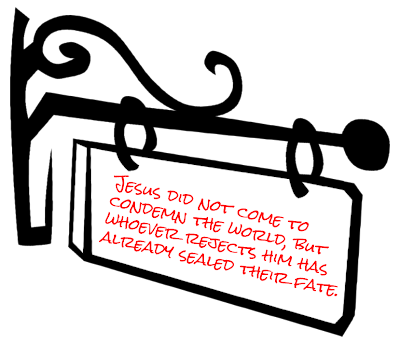 Jesus did not come to condemn the world, but whoever rejects him has already sealed their fate. This part of the sign was probably the most inflammatory, since the scribes and Pharisees were the ones who were rejecting Jesus. "This generation" was going to be judged by the Ninevites because of their lack of repentance. There is more to the Sign of Jonah than what meets the eye. Clearly, the most important part of the sign is the most obvious one: Jesus' death, burial and resurrection. Without that, the Christian faith is of no use whatsoever. However, there is a lot of background knowledge that goes into this particular passage of scripture and allows us to have an enriched understanding of Jesus' ongoing ministry. Do you have any more thoughts about the Sign of Jonah? Let me know what they are in the comments section. I'd love to hear them!